While such feelings are understandable, they arise from an often-unexamined notion: Krishna is a finite person like us, situated in only one place, the spiritual world. Even if we know philosophically that Krishna is omnipresent, we don’t often assimilate or even contemplate his omnipresence. Nonetheless, advanced spiritualists relish Krishna’s omnipresence constantly. 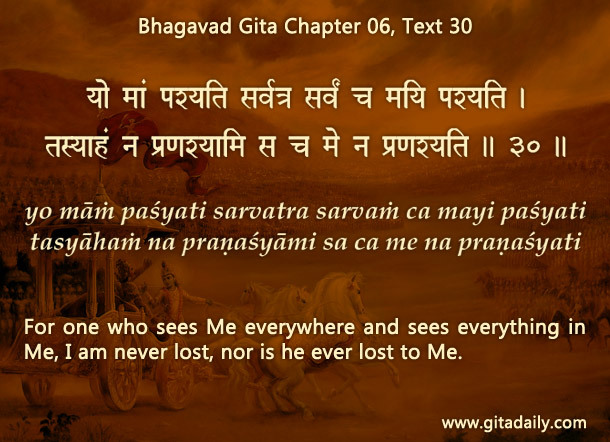 They see Krishna in everything and everything in Krishna; he is never lost to them; nor are they ever lost to him (Bhagavad-gita 06.30). Krishna cares so much for all of us that he accompanies us constantly in our hearts (18.61). Indeed, he is always closer to us than the person closest to us can ever be, even if they hold us in the tightest of hugs. How can we habituate ourselves to thinking of Krishna? By practicing bhakti-yoga diligently, using its many practices and resources to direct our consciousness toward Krishna. While practicing direct bhakti activities, if we consciously and conscientiously strive to think of Krishna, that endeavor will make Krishna-thoughts habitual. By such habituation, we can more easily think of him at other times too. When regular Krishna-thoughts bridge the distance between Krishna and us, we relish his proximity constantly. Krishna is far away from us – why is this an uninformed feeling? How does thinking of Krishna help us realize his presence? How can we habituate ourselves to Krishna-thoughts?